two chicks knew a fox was at large. so Hensel and Gretel took charge." Authors Corey Rosen Schwartz and Rebecca J. Gomez have partnered on another installment in their growing picture book franchise which includes The Three Ninja Pigs and Ninja Red Riding Hood. 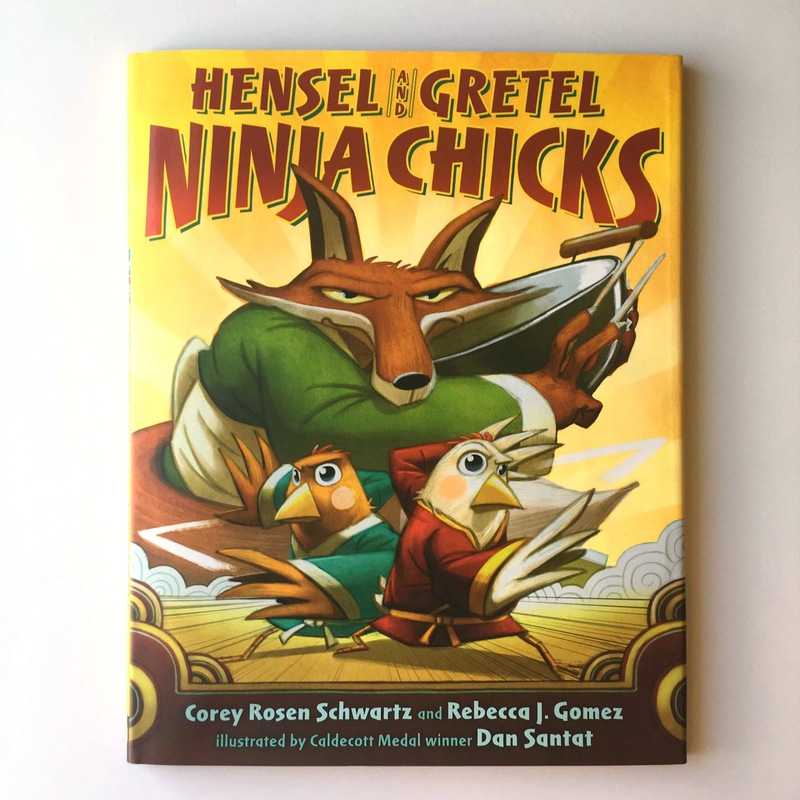 In Hensel and Gretel: Ninja Chicks, two ninjutsu-trained sisters have to save their parents from the fox who has kidnapped them. 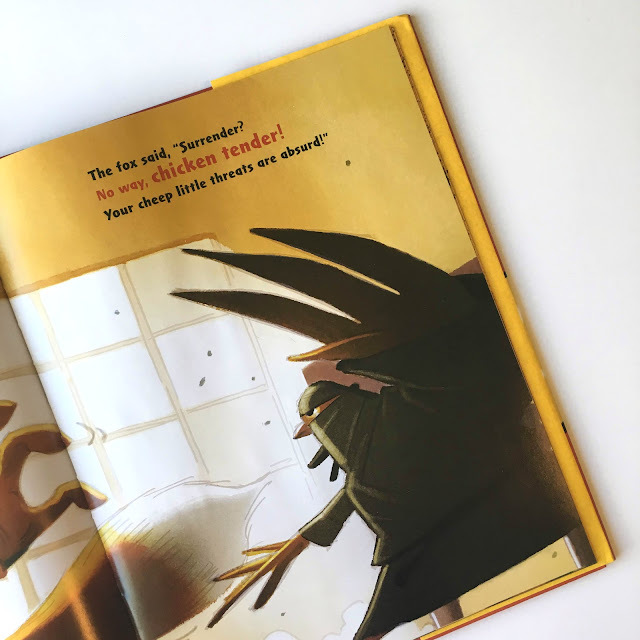 As you've guessed, the children's authors retell classic fairy tales with a karate twist. Initially, I was drawn to this particular picture book because I saw Dan Santat was the illustrator. I loved his picture book The Adventures of Beekle: The Unimaginary Friend (you can read my book review here), for which he won the 2015 Caldecott medal. Sadly, his brush illustrations for Hensel and Gretel weren't as eye-catching for me as some of his previous work. 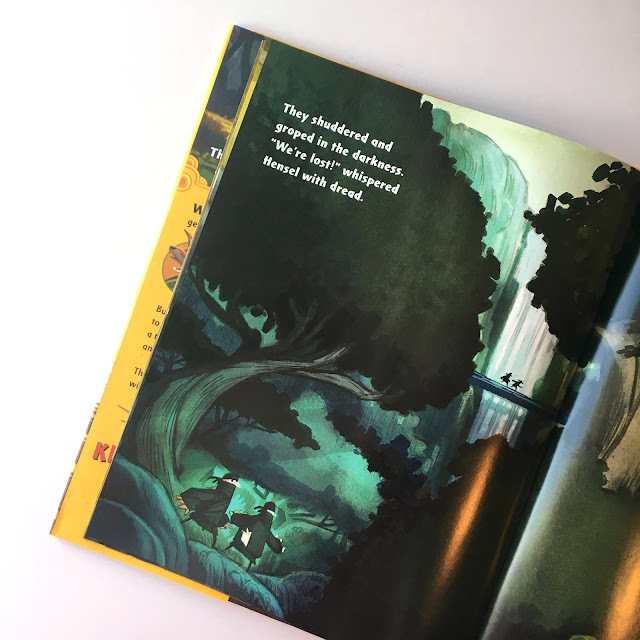 I liked a mid-book spread that illustrated a nighttime forest scene and anywhere in the book where he used vibrant blues. Other than this, some of the depictions were so large and busy that I didn't spend much time enjoying them like I normally would when reading one of his books. The Hensel and Gretel story itself is fine, though again nothing struck me as particularly fantastic. I did genuinely appreciate that both of the main protagonists are female and instead of being the victims of parental abandonment, the children rise to the occasion to heroically save their parents. This framework was a great idea and I liked the empowerment themes, however the karate-chop moves the sisters employ to rescue their mother and father were a bit silly and the rhyme scheme and writing overall were just OK. The funniest line in the book? "The fox said, 'Surrender? No way, chicken tender!'" If your kids are fans of Schwartz and Gomez's ninja picture-book series, then they'd likely enjoy this new addition as well. If you haven't picked up the series or feel a little wary about whether or not your kids would be engaged in the storyline, I'd recommend passing on this one or checking it out at the library before purchasing a copy. I love fairy tale retellings--the classic Grimm, Perrault, and Hans Christian Andersen tales are always a hit--but the ninja formula feels a bit forced here.